Here are nine healthy habits you should adopt. There’s no doubt that lab life is hectic and sometimes overwhelming. Projects, paperwork and even small tasks can quickly pile up. You can de-stress your daily routine and get projects done more efficiently and effectively by adopting these nine habits. Keep up to date with your lab notebook. 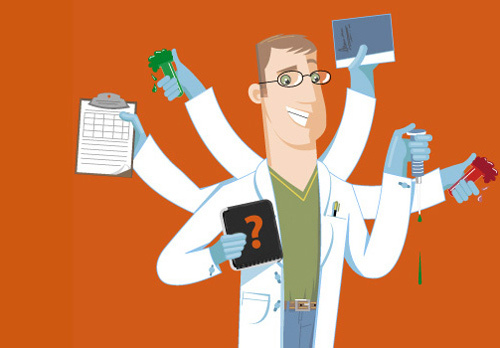 Backlogged or inconsistent recordkeeping of experiments and results is one of the most common mistakes that results in missing data or losing hours while trying to catch up. Free and commercial electronic notebooks can make it easier to keep an accurate notebook every day (and search through it later, too). Some also help organize project plans, specimens and reagents so you can spend less time rummaging through freezers, shelves, and to-do lists. Manage data and results as you go. Compile results into graphs, charts, and figures as you analyze the data to make drafting meeting slides, reports, and papers easier. Minimize “down time” by planning your experiments far ahead of time, especially when communal equipment and supplies are necessary. 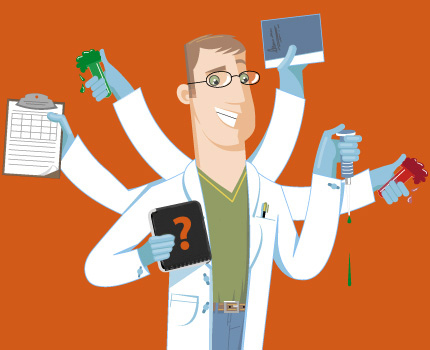 Preventable delays are one of the most common causes of scientific inefficiency. At the beginning of each week, try forecasting your experimental schedule for the following week or two. Resolve any anticipated equipment scheduling, reagent orders, specimen prep, or potential chokeholds that might require troubleshooting. Ask for help when troubleshooting. While everyone strives to be self-sufficient, many times an experienced colleague can provide a simple solution or trick to save days of unnecessary experimenting. Keeping an electronic notebook with a team including short notes about your own troubleshooting experience helps others on your team avoid repeating the same mistakes or spending as much time fixing them. Academics in particular need to know when to drop a project that isn’t working, even if it’s near and dear to your heart. A good mentor should guide you towards robust projects that will lead to publications, but it’s also up to you to consistently balance multiple potential projects in case one doesn’t pan out. It’s not uncommon to see graduate students and postdocs lose years off of their careers being forced to or stubbornly trying to turn around a dead-end project. While it may seem counterintuitive, take a breather. Get inspiration and help for your current projects by continuing to network, collaborate, and read papers and news in your field. Send out a note each week to an old colleague. You’ll be surprised at the value of these interactions over time. Some projects may be most efficiently performed at a certain time of day. Intense focus and reflection is typically best in the late morning, while distractibility is highest in the afternoon. Interestingly, some studies suggest that creative reasoning may be best when one is tired (Wieth et al., 2011). Evaluate your daily productivity patterns to figure out how to apportion your workload for maximum efficiency. When unplanned projects or tasks constantly interrupt your day, completing one difficult task before mid-morning can help to regain a sense of accomplishment for the day. Last, but not least… of course… DON’T PROCRASTINATE! Procrastination is a steady source of humor for the popular PHD Comics, but continuing the habit in your career can have a deleterious impact on project momentum short-term, and hinder your ability to reach long-term goals. Know the keys to combating procrastination to stay one step ahead of your tasks as much as possible. Jovana J. Grbic, Ph.D., is manager of scientific outreach for BioData, makers of science management software Labguru. She is also the founder and lead blogger at ScriptPhD.com. Previous articleEnter the GEN Ten Survey for Your Chance to Win an iPad Mini!